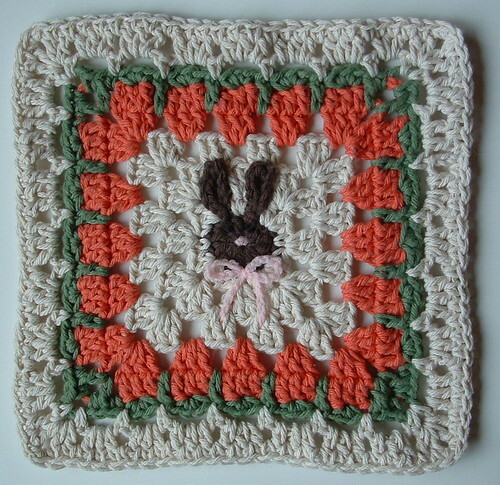 When I first saw the McGregger’s Garden Square, I knew I had to crochet it for a dishcloth. It’s just so cute and would make a wonderful Easter gift. I used a H (5 mm) hook when I was crocheting the square as I didn’t have a G hook available. Once I finished the square I added a few more rows to make it big enough for a dishcloth. I used Sugar’n Cream Ecru cotton to do the last 3 rows. You will start in any stitch where you did a long Dc on the last green carrot top row. Row 1: Sc into the long Dc of the prior row, then ch 4, skip over to the next long Dc and do a Sc in the stitch. Repeat around and in corners work Sc, ch 2, Sc. Join with slip stitch into 1st Sc.